Here is our Lovers Stein. Meticulously hand painted with precise detail, this stein features a romantic couple on a balcony standing amidst roses, doves and angels. Castles decorate the background. The German phrase on the side states, O schoene Zeit Du Zeit der Liebe, which means, Oh what a wonderful time of love. 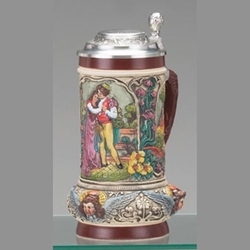 With a flared base, this stein is a classic Thewalt stein and is one of his all time best selling items. A roseten pewter lid rests on top. Made in Germany. Please note: These are made to order and require up to a 90 day lead time. Please contact us before you order to check stock if you are in a hurry. Cannot be canceled once ordered.